When Herod saw that he had been tricked by the wise men, he was infuriated, and he sent and killed all the children in and around Bethlehem who were two years old or under, according to the time that he had learned from the wise men. Then was fulfilled what had been spoken through the prophet Jeremiah: “A voice was heard in Ramah, wailing and loud lamentation, Rachel weeping for her children; she refused to be consoled, because they are no more.” Matt. 2:11-18. 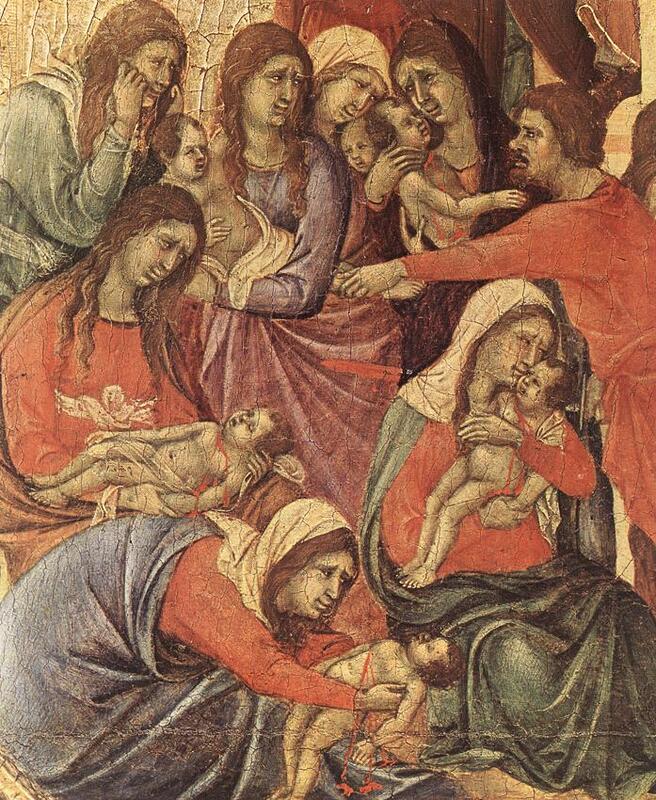 Today the Church remembers the slaughter of the Holy Innocents. Here, we encounter a ghastly and appalling story, but I think there are several lessons we can take from this narrative. We should first examine the character of Herod (known to historians as Herod the Great). Although Herod greatly expanded the Second Temple, he also murdered many rabbis and members of his own family. He collaborated with the Roman occupation, and he reigned with a demented savagery. While scholars may question the historical accuracy of this account in Matthew’s gospel, Matthew’s portrayal meshes well with what we know of Herod’s character. At the root of these frightening events, we find a genuine insight into Herod’s depravity. Herod fears losing power, and that phobia sparks his maniacal infanticide. Into this world, the Christ child is born. The world hasn’t changed much. From Dachau to Serbia to Darfur, Herod is still afraid, and the slaughter of the innocents continues. And this remains the world into which Christ enters. And ultimately, Christ offers himself as a victim of our savage history. Matthew offers another insight in this story. The Holy Family protects the Christ child, traveling to Egypt to escape Herod’s rage. Matthew refers to Hos. 11:1 and Exodus 4:22-23 with a purpose. He’s telling his audience that Jesus is the new Moses: just as Moses delivered the chosen people from slavery, Jesus will free them from sin and death. Moses and the Prophets reveal God’s dedication to mankind’s salvation; in the Christ child, that dedication becomes incarnate. I’m also fascinated with the impulse of Mary and Joseph: I think there’s something more at work here than the simple protective impulse of Jesus’ parents. You see, I think they’re still out there in the world today: Pharoah, Herod, Stalin, Pol Pot and the other slaves to fear and hatred. This entry was posted in Uncategorized and tagged Anglican, Bible, Disciple, Christianity, Dominican, Episcopalian, Flight into Egypt, Gospel of Matthew, Herod, Holy Family, Holy Innocents, Jesus, Moses, Salvation, Spirituality. Bookmark the permalink. I realize that this isn’t really a response to your post, James, but I can’t help but add these thoughts. Holy Innocents Day mostly passes by quietly during Christmas week. Yet I would wish that the bitterness of this event not only be remembered but become a time for us to reflect deeply on the plight of innocent children who have died or suffered almost beyond our belief at the hands of tyrants. Not only tyrants but also lesser bullies and negligent adults. I weep with Rachel for the innocent children still sold into slavery, working in sweatshops, and exposed to immoral behavior all over this earth. I weep for the handicapped and sick girls and boys who receive only minimal care. I cry for the 20,000 innocent Iraqi children who have been killed in the past ten years. The list could go on and on and on and . . . These are the little ones whom Jesus cared for most deeply. I think it’s a perfect response to the post. Thank you so much for directing our gaze to the place where Jesus would look. Heord was consciously willing to “mistake” any and all of the children for the One Child. If someone were out to attack Christ, how likely is it that they would mistake me for Him? Just a question. I wonder how often we find our inner-Herrod willing to kill the Christ within us? I wonder if this is not, in some sense, a psychological drama we all live out. I’ve been reading your blog for awhile now and I truly appreciate your insight. As a Methodist preacher I think we share much common ground. Thank you for sharing. Happy new Year. Many thanks. I’m so glad you enjoy the blog. I wish you a new year full of joy and awe and wonder and peace. You are interesting James Dennis. Have a wonderful year, Sindee. I’m in agreement with your assessment of my brother, Eckhart. Have a wonderful new year, full of grace and joy.